Nose: Grape juice, pears, oak, vanilla fudge, brown sugar, and faint notes of paint thinner. Palate: Heavy on the oak flavours – quite woody up front, and full of oak spices at the back end. Pretty sweet, with some slight fruity salad notes. Hints of vanilla fudge or cake icing. Mouthfeel: Fairly light and mellow. Very dry. There is no burn at all. Lacking any significan body for a whisky of its age. Finish: Oak spices, and (very) faint traces of vanilla. The finish is so short it is practically non-existent. Balance: This whisky is pretty consistent all the way through. It is however a little thin – especially for a 21yo whisky – and also a little on the sweet side. Cruinnich – Gaelic for ‘gathering’, is part of William Grant & Sons new Rare Cask Reserves range, which blends select casks of rare vintage malts and grains from Grant family’s store houses. Cruinnich is a vatting of casks that were chosen by William Grant head distiller Brian Kinsman and a group of Australians that won a competition with national liquor chain, Dan Murphy’s. This whisky has an age-statement of 21 years, was bottled at 42%, and is a run of 4900 numbered bottles. This bottle is bottle number 2327, and comes from batch WHV4/2219, which was selected on 22/10/2014. Cruinnich is the second release in William Grant’s Rare Cask Reserves line, after the Ghosted Reserve from Ladyburn and Inverleven – and is exclusive to the Australian market. 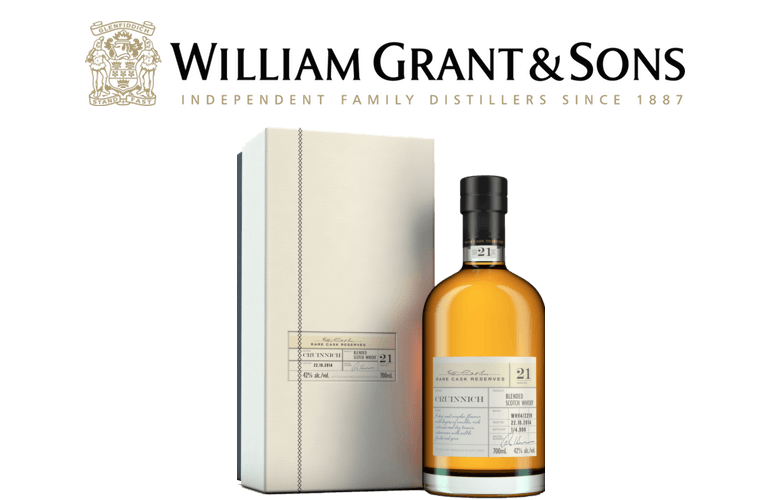 William Grant & Sons label themselves as “independent distillers” in their marketing of their Rare Cask Reserves, which is not incorrect – they are family owned and operated, and has been owned by the same family for its entire existence (since 1887). That does not mean that it is a small affair by any stretch of the imagination – with the Glenfiddich, Balvenie, Girvan, Kininvie, Ailsa Bay, and Tullamore distilleries under its belt; and the Glenfiddich, Grant’s, Balvenie, Tullamore Dew, Gibson’s, Clan MacGregor, Monkey Shoulder, Ladyburn, and Girvan brands in the stable. It also has a 30% stake in Highland Distillers (which is run by Edrington as a subsidiary) – which includes brands such as The Macallan, The Famous grouse, Highland Park, and Black Bottle. Despite being an family owned and operated business, William grant & Sons is the third largest producer of Scotch whisky, after Diageo, and Pernod Ricard; and produces approximately 10.4% of all Scotch – a position it gained from being one of the main pioneers of single malt Scotch after they introduced their Glenfiddich single malts range in 1887.